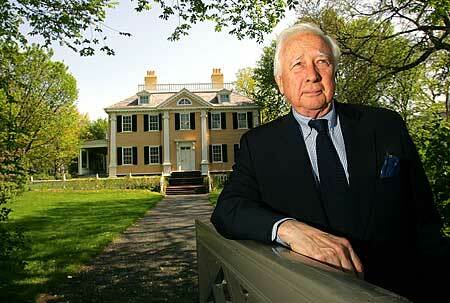 David McCullough spent seven years researching and writing his Pulitzer Prize-winning biography of John Adams. David McCullough knows better than almost anyone what John and Abigail Adams’ 18th century world looked like. Having spent seven years researching and writing his Pulitzer Prize-winning biography of the second president, he says an upcoming HBO miniseries will be as close as it gets to the real thing. Based on McCullough’s 2001 book and created by actor Tom Hanks’ Playtone Productions, the series stars Academy Award and Golden Globe Award nominees Paul Giamatti as the nation’s second president and Laura Linney as Abigail. It is scheduled to air a year from now. The project is in the works as a very different sort of John Adams production - a new presidential dollar coin - is set for its ceremonial launch in Quincy next Tuesday. U.S. Mint director Edmund C. Moy will join local officials, students and business leaders for a coin exchange and other activities. The brass-clad, copper Adams dollar was officially issued at banks and other financial institutions across the country yesterday. Adams and his famous wife have been prominently treated on stage and screen over the years, notably in the Broadway musical and film “1776” and public TV miniseries “The Adams Chronicles” in the 1970s. But this is the first time the image of Quincy’s Founding Father has ever been on a regularly circulating piece of currency. “John Adams” is seen by media watchers as one of HBO’s next big bets, and marketing scholars like Boston University professor Roberta Clarke say the miniseries has the potential to make a McCullough-sized impact on a different audience. 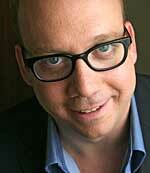 “A lot of people who aren’t readers will watch TV,” Clarke said. McCullough’s bestseller is credited with almost single-handedly reviving Adams’ standing with the general public. Clarke said the HBO production could create a push-pull effect with McCullough’s book, much as the film versions did with J.K. Rowling’s Harry Potter fantasy novels. The HBO version of “John Adams” traces the first 50 years of the United States, from the Revolutionary War through Adams’ death, with John and Abigail’s love story as part of the drama. Hanks optioned film rights to McCullough’s book soon after publication. Local Adams devotees were chagrined that the project spurned Quincy and Boston, where the events actually happened, but McCullough and others have said it wasn’t really possible for a production like HBO’s to use the actual locations, since they’re too urbanized now. Instead, Playtone recreated the John Adams and John Quincy Adams birthplaces on location near Richmond, Va.
To McCullough’s eye, they’re so accurate “you’d think you were in Quincy (in the 1700s), with the farmland around them,” he told The Patriot Ledger.